The average adult in the United States downs between 20 and 25 teaspoons of added sugar a day, severely exceeding the recommended maximum of 10 teaspoons (40 grams). 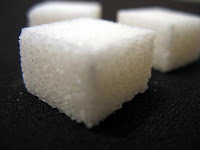 Below, some tips to cut down on added sugar without sacrificing taste. * When buying canned fruit, make sure it is packed in its own juices rather than an artificial, heavy syrup. Remember, fructose, the naturally-occurring sugar in fruit does not deserve the same concern as processed, refined sugar. You save: 8 grams/2 teaspoons of added sugar. * Have regular Cheerios for breakfast and add your own dried fruits and nuts to it, rather than pouring a bowl of Honey Nut Cheerios. You save: 8 grams/2 teaspoons of added sugar per cup of cereal. * Forego packaged salad dressings for homemade vinaigrettes (combine vinegar, the oil of your choice, and any spices and herbs that suit your mood). You save: 10 grams/2.5 teaspoons of added sugar). * Add your own toppings (raising, nuts, cinnamon, pumpkin pie spice, vanilla extract) to plain oatmeal rather than purchasing flavored oatmeal packets. You save: 12 grams/3 teaspoons of added sugar. * When craving chocolate, have a serving of one comprised of 85% cocoa, rather than milk chocolate. You save: 17 grams/4 teaspoons of added sugar. * Buy plain yogurt and add your own fresh fruit to it, rather than purchasing flavored yogurt. You save: 20 grams/5 teaspoons of added sugar. * When looking to quench your thirst, have a glass of flavored seltzer rather than one of regular soda. You save: 32 grams/8 teaspoons of added sugar. Remember, low sugar does not always mean low calorie! Always read food labels to determine how many calories you are getting. It is still possible to overeat without having too much sugar, but a lower intake is better for our overall health.